The Philadelphia Facade Ordinance is now Law. Get Inspected – we can provide swing stages and sidewalk sheds to give your inspector access to your building, quickly (usually within 24 hours) and inexpensively. Superior can file all the necessary paperwork for the City Permit for your shed. 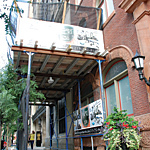 Remain Open – we can erect a new sidewalk shed or add on to your inspection shed quickly, cost effectively and built entirely to City of Philadelphia codes for sidewalk protection. Our emergency service is guaranteed to start within 24 hours! Handle Your Repair – our full line of scaffolding gives you all the options regarding cost vs. turn-around time decisions. Swing Staging – our most cost effective approach. 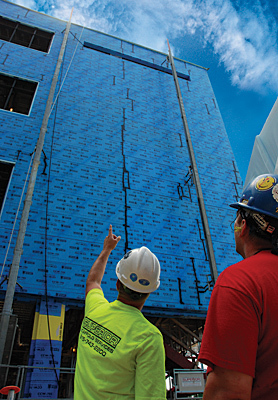 Pipe Scaffold – the fastest way to get a big job done. 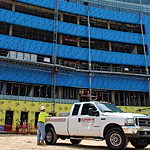 Mast Climbing Platforms – great cost effective solution for tall buildings in particular. The new ordinance affects buildings six stories or more in height, all buildings with any appurtenances in excess of 60 feet, and any building, other than one or two family dwellings, greater than two stories. 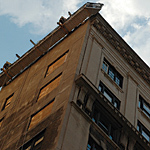 The ordinance sets a schedule to which building owners must adhere for the inspection of facades and any subsequent repairs. 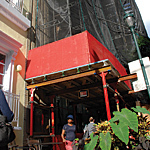 Those owning structures constructed before 1950 are required to inspect their facades by June 30, 2011. Properties built between 1951 and 1970 must have inspections completed by June 2012. Buildings constructed between 1991 and 2005 would need inspections done by June 2015. Following the initial inspection, each building is required to be reinspected every FIVE years and the reports filed with the Department of Licenses and Inspection.